A man wanted for murder in Mexico has been deported by ICE according to a report released late last week from U.S. Immigration and Customs Enforcement. 47-year-old Servando Camacho-Velazquez (aka El Baron) had also recently served 18 months months in the Arizona Department of Corrections for a felony drug smuggling conviction. He was previously deported in January 2014 through Del Rio, Texas. 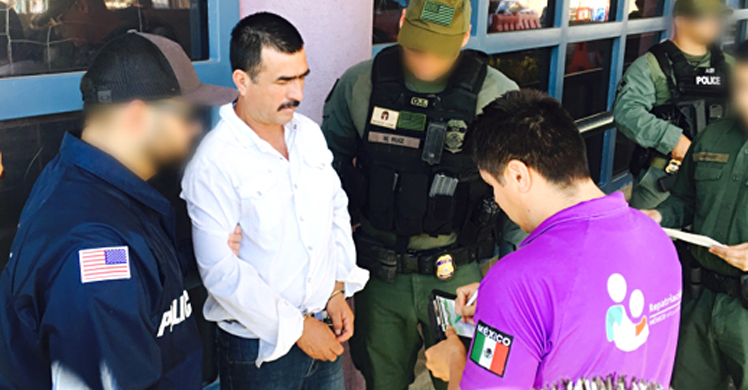 A previously deported Mexican man wanted in his native country for aggravated homicide was removed Tuesday by officers with U.S. Immigration and Customs Enforcement’s (ICE) Enforcement and Removal Operations (ERO). Servando Camacho-Velazquez (aka El Baron), 47, was transferred to the custody of representatives from Mexico’s Procuraduria General de la Republica (PGR) and Mexican immigration officials by ERO officers at the DeConcini Port of Entry in Nogales. Camacho-Velazquez is named in an arrest warrant issued Nov. 4, 2015, by a judge in Hermosillo, Mexico. Camacho-Velazquez most recently entered ICE custody Feb. 16 after serving 18 months in the Arizona Department of Corrections for a felony drug smuggling conviction. Department of Homeland Security databases indicate Camacho-Velazquez was previously deported in January 2014 through Del Rio, Texas. ICE reinstated his prior removal order, paving the way for Wednesday’s repatriation.